NEWSLETTER OF THE NORTH MANCHESTER HISTORICAL SOCIETY, INC. 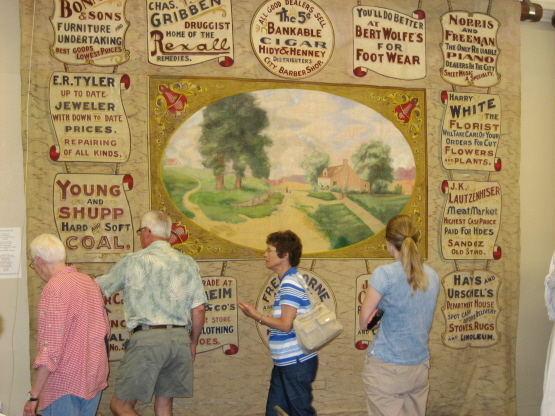 When the North Manchester Center for History decided to explore whether we could restore a rare c. 1910 opera curtain in its collection, little did we suspect that the project would turn into a year-long celebration involving lectures, programs, community groups and commissioning an original artwork. We are grateful for the many groups, businesses and organizations that made the “Year of the Opera Curtain” possible. Special thank-yous go to major sponsors Beacon Credit Union, Manchester University, Poet Biorefining and Shepherd Chevrolet, as well as JP and Michelle Freeman and the Community Foundation of Wabash County. Restoring the 1910 Curtain. The curtain in question was given to the NM Historical Society in 1985 by J. P. Freeman and his mother Minnie Freeman. It was found in the attic of their business, the Main View Tavern, and featured advertising from businesses active in North Manchester around 1910. It is large – approximately 16 feet by 13 feet. Some areas of the curtain were severely damaged. As we contacted professional conservators in the state, we found that opera curtains such as ours are quite rare. They did not survive fires, being rolled up, and being subject to mold and mildew. There are only two opera curtains that we know of in Indiana. Curtains often depict a romantic landscape; those with advertising on them are even rarer. Conservator Jennifer Hein of Indianapolis was hired for the project. We arranged for her to pick up the curtain and do a preliminary assessment. Remember when the Smithsonian restored the Star Spangled Banner originally created in 1813? The public was able to watch the painstaking process. We wanted to allow community members to see and understand our project, which is similar. For two days, we invited the public, as well as college and high school art and history classes, to see the curtain and hear the conservator talk about how she planned to approach the project. Ms. Hein has extensive experience in textile restoration, and she provided a wealth of information about dyes, fabrics, cleaning procedures and solvents. At this time we asked that the curtain not only be stabilized, but that it be brought back to its original “look” to the extent possible. This decision was made because, while the curtain might be less valuable because the provenance was altered, we felt it was of primary value mainly to North Manchester and the restoration would be more appropriate for us than a stabilization. The final results were spectacular. The restored curtain was unveiled in April and now hangs at the Center for History. By the way, as rare as this curtain is, we have a second opera curtain from the same era in our collection! Programs Inspired by the Restoration. Restoring the 1910 opera curtain lent itself to a number of interesting programs. Two of our monthly dinner programs were dedicated to the opera curtain project. In March, conservator Jennifer Hein explained the conservation process for our curtain. In April, Manchester College professor Katherine Tinsley presented a program on the importance of opera houses in small towns in America. She used research provided (thank you, Allan White) about actual programs and events held in our opera house, and broadened the context to include the general experience in America. On May 13, we unveiled the restored curtain. Manchester College opera workshop students under the supervision of Dr. Debra Lynn presented a one-act comic opera in English to the guests who came for the unveiling. On June 6, we unveiled the contemporary opera curtain we commissioned and held a thank you reception for the businesses that supported the project and the Manchester High School students who produced the contemporary curtain. A short program compared the businesses on the 1910 curtain to their equivalents in 2012. The February issue of this newsletter included a reprinted interview with local historian Dr. L. Z Bunker from 1982 concerning the opera house and its curtain. The rest of the issue was dedicated to excerpts from the North Manchester Journal of October 15, 1885, which described a devastating fire that destroyed the opera house and several other downtown businesses. The opera house was rebuilt and opened the next year. Contemporary Opera Curtain Commissioned. As we restored the curtain, we realized that it had originally served as an advertising piece, but now, 100 years later, it serves more as an historic record of the businesses that were active in North Manchester at the time. None are operating today, but the curtain provides a unique record of the products and services that defined the town long ago. We decided to commission a contemporary opera curtain and invite current businesses and organizations to be part of it. The NMHS provided the materials and approached businesses for sponsorship and advertising. We pointed out that the contemporary curtain will hang for many years in the Center for History, next to the restored curtain. It will document current businesses and organizations 100 years from now, just as the 1910 curtain does. We approached local businesses which had a business or function similar to the ones on the 1910 curtain. Major sponsors for the “Year of the Opera Curtain” Beacon Credit Union, Manchester University, Poet Biorefining and Shepherd Chevrolet are featured prominently on the contemporary curtain. Also appearing are the Fine Arts Club, Peabody Retirement Community, Timbercrest Senior Living Community, McKee Mortuary, Harting Furniture, and Riverbridge Electric. Rounding out the advertisers are KenapocoMocha Coffee House, Fahs Brown Plumbing (representing the Manchester Early Learning Center on the curtain), First Financial Bank, Newmarket, Creative Stitch Quilt Shop, One World Handcrafts, the Main View Restaurant and the Firehouse Theater. Students who helped paint the curtain are Katie Durden, Hannah Lochner, Tawni Kincaid, Paige Blocher, Krisy Mize, Evan Wilcox, Treya Paquera, Katie Floor, Madison Isbell, Brittani Weimann, Marret Metzger, Bradley Miller, Mariah Mobley, Claire McLaughlin, Mick Avery, D.J. Norwood, Allissa Isley, Myra Long and Samantha Hall. The Firehouse Follies. On June 17, the NMHS and the Firehouse Theater presented the Firehouse Follies. The NMHS approached this civic theater group about presenting a review of local talent performing acts that are similar to those that once appeared at the North Manchester Opera House. The contemporary opera curtain served as a backdrop in the performance space. The Firehouse Theater folks invited community members to perform in the spirit of 1910. Allan White provided extensive information about opera house events based on the local newspapers of the era. For example, a Mandolin Chorus met at the Opera House once; we had a ukulele chorus. We know that Uncle Tom’s Cabin was a very popular touring play that performed several times at the Opera House. These troupes had elaborate scenery and even brought in live bloodhounds to help chase the character Eliza when she tries to escape. Our offering was to have a dog act—four service dogs performed simple tricks and stole the hearts of the audience. David Lawrenz served as emcee, introducing the acts and providing jokes and information to keep the show moving. He worked in information about how important the opera houses were before the days of telephone, radio, movies, television or the internet. The opera house was the biggest room in town, and provided a space for entertainment, educational lectures, graduation ceremonies, and even roller skating and basketball games. The evening started with an hour-long concert by the Manchester Community Band. Jim Smith followed with a stirring rendition of Casey at the Bat, followed by the Canine Companion Tricksters: Annabelle the Scottish Terrier under the command of Marilyn Mason, Dkyler the Boarder Collie with Deana Davis, Breeze the Labradoodle with Susan Sharp and Chloe the French Bulldog with Debbie Bryant. David Moan performed songs from the Civil War, Marching through Georgia and Just Before the Battle, Mother, followed by Toby Tobias as Victorian wrestler Ed “Strangler” Lewis (you had to see it to believe it). The Kruschwitz Ukulele Choir performed several numbers, highlighted by LuAnn Harley leading the audience in a simple hula to Aloha Oe’. After a brief intermission, the Eel River Choral Society sang My Life Flows on in Endless Song and A Wonderful Savior is Jesus. Local storyteller Mac McKinley read two James Whitcomb Riley poems (Riley appeared at the NM Opera House several times), followed by fiddle tunes from the Fiddling Kruschwitzes, Brian and sons Harley and Owen. The evening closed with the performance of an original melodrama written for the NMHS by Charles and Dagny Boebel, Dolly’s Dilemma, or Who Will Pay the Money for the Mortgage on the Farm? Sarah Hawkins Moan, David Moan and Andrew Chinworth played the sobbing heroine, dastardly villain and hero (in all white costume) in this drama with contemporary twists. Kathy Hawkins cued the audience to participate with posters urging them to boo, hiss, cheer and applaud. A wonderful time was had by all. Audience members asked if we could do this again next year! Please watch the newspaper for more programs this fall that are associated with the NMHS Year of the Opera Curtain. Traveling Exhibits. This year the Center for History has continued to take advantage of a wonderful program offered by the Indiana Historical Society, traveling historical exhibits. In May and June, 2012, we hosted Who Do You Think You Are? an excellent exhibit on immigration in Indiana. The North Manchester area is fairly homogeneous in the origins of its population, but Indiana as a whole has a very diverse population. The exhibit was accompanied by photos, documents and maps outlining this complexity. During the late summer, coinciding with FunFest, we are presenting Indiana Cartoons and Cartoonists, a subject that should be appealing to all ages. It is available for viewing July 31 through September 4. Our final traveling exhibit of the year is October 11 through November 14. Endangered Heritage is an unusual exhibit because its display will be scattered throughout the Center for History. The exhibit highlights challenges faced by museums about how to preserve for future generations the objects and documents that are part of our heritage. The common dangers to collected materials are critical issues right here, right now. Examples from our own holdings will complement the exhibit. Last year the Center for History brought to North Manchester exhibits on The Care and Identification of Family Photographs, Indiana Through the Map-Maker’s Eyes and a collection of World War II photographs, enhanced by NMCH window displays saluting local veterans. In the past we have also hosted exhibits on Post Office Murals and on The Auto in Indiana. Next year watch for exhibits on Lincoln and the Civil War as we commemorate the 150th anniversary of that conflict. The IHS gives not-for-profits the opportunity to display exhibits on topics of interest in Indiana History. Their list of exhibits includes over 20 different choices which can be booked for approximately one month. Three exhibits can be displayed every year for free, and the Center for History is scheduling the maximum. We would like the community to recognize the Center for History as the place where these excellent exhibits are available to them on a regular basis. You don’t have to travel to Indianapolis to see them. Center for History Awarded National CAP Grant. This winter, the North Manchester Historical Society applied for and received a national grant that will provide us with a wealth of information about how to better care for the artifacts entrusted to us, and how to utilize our building better. The Conservation Assessment Program (CAP) Grant is a competitive program that is run by the Institute of Museum and Library Services (IMLS) and Heritage Preservation, The National Institute for Conservation. Heritage Preservation will provide funds to bring professional conservation and building preservation specialists to the Center for History, who will identify the conservation needs of our collection and buildings and recommend ways to correctly improve collection and building conditions. Their report will help us evaluate our current collections care policies, procedures and environmental conditions. It will help us make immediate, mid-range and long-range plans for improvement. Some granting agencies require a CAP assessment before an organization can be considered for funding. The reports findings will be suggestions for planning purposes, and will not be requirements. We are thrilled that our conservation assessor will be Ramona Duncan-Huse, Senior Director of Conservation and Preservation Imaging for the Indiana Historical Society, and our building assessor will be Mary Ellen Rudisel-Jordan, Warsaw architect with the firm Scearce-Rudisel. Both have considerable CAP assessment experience and extensive experience in historic preservation issues. The assessments will take place in October, with a final report early next year. Since 1990, 2,700 museums have participated in CAP, including museums in all 50 states. 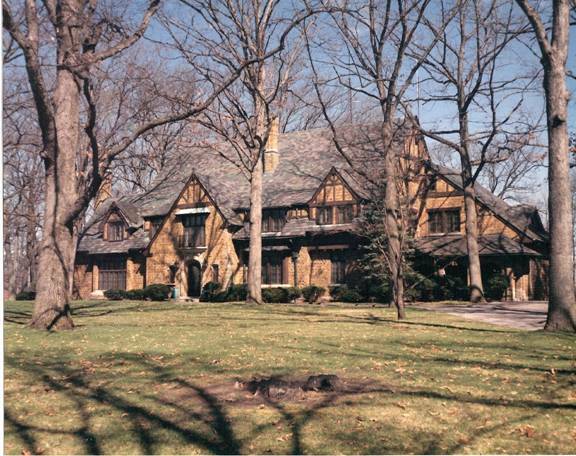 In 2012, the Center for History is one of two organizations in Indiana receiving CAP grants. New Office. While the Center was closed over the winter months, we set up a permanent office downstairs so that the CFH could be open more. With the addition of two desks, a computer, printer and high-speed internet, at the front door, we are now able to be open Monday through Friday from 10 a.m. to 4 p.m. and on Sunday afternoons 1 p.m. to 4 p.m. We increased our open hours from 8 per week to 33 per week, an increase of over 400%. Now that docents have computer and internet access, including access to our museum records, they can help with a variety of projects that help the Center for History manage its collection better. The response from visitors has been phenomenal. Thomas Marshall House Opening. 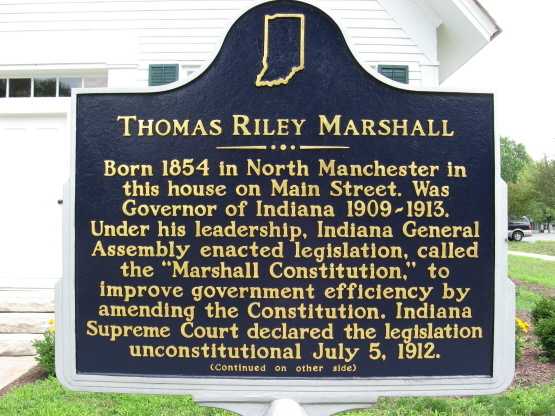 After many years of preparation, the birthplace home of Thomas Riley Marshall is now open. Dressed in the period style of the 1850’s the home educates visitors on what it was like to live during that period. The home also features the doctor’s office of Tom’s father, Daniel, and the kitchen of his mother, Martha. Steve Batzka looked high and low for just the right period pieces to furnish this small house. A donation from Evelyn Niswander, a long-time member of the project, helped us purchase furniture. You won’t want to miss viewing it when we open it during Fun Fest. The hours will be published. 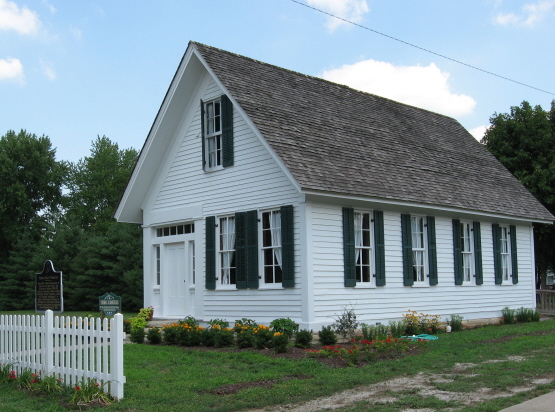 We thank all of those who worked on making this house museum become a reality and would especially like to recognize the Community Foundation of Wabash County for the grant we received to help furnish it. The America In Bloom Committee made and installed the fence and plantings, the Manchester Garden Club planted the herb garden, and Ryan Baker at Manchester Greenhouse supplied planting materials. Last year, the Rotary Club, capably led by Deb Brauneller, gave a fresh coat of paint to the house and shutters. Jim Mishler and Steve Batzka also had a big role to play in these endeavors. The North Manchester Historical Society anticipates having this historic home open monthly if several more volunteers can be found to guide visitors through while telling its rich history. 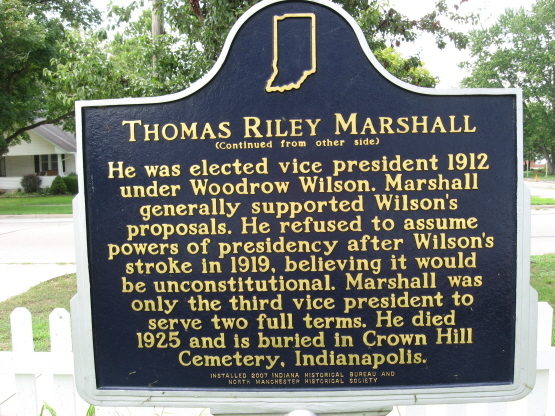 Please call 260-982-0672 or stop by the Center for History if you are interested in being a Thomas Marshall docent. Gift Shop. Our American Gift Shoppe has grown. We now have a larger dedicated space at the front of the Center for History with new items for sale. Many more historic books are available including Gladys Airgood’s popular book of Servia’s history. New items include a model DeWitt automobile (just $15), and wooden toys crafted locally at Silver Lake, Indiana, and reminiscent of the toys from yesterday. A variety of new postcards are available, sold only at this museum gift shop. Most of the souvenirs with which you have become familiar, are still available. Our past Newsletters are also on display for sale. There is a fee to tour the Center for History at $3.00 per person (free for NMHS members) since we believe that we have a quality product to show you which is ever changing, and we need to try to cover some of our expenses. However, visiting the Americana Shoppe is free, so stop by anytime to find that special gift you might like to give to your visitors, past N. Manchester alumni, or for weddings, at Christmas time, etc. Christmas Windows and Cookie Exchange. Plans are under way to make this holiday season special on Main Street. Your local merchants, the Chamber of Commerce and N. Manchester Main Street are already hard at work planning our holiday activities for your enjoyment. The North Manchester Historical Society and Center for History have a new plan for making our windows look just right for the Christmas season. And instead of holding our annual bake sale during Fun Fest, we are switching things just a bit and plan to hold a cookie exchange and bake sale some time around the Thanksgiving and Christmas holidays. Plan to participate in the cookie exchange to increase the variety of sweets to offer your holiday guests. Antiques Appraisal. We look forward to offering an annual antiques appraisal here at the Center for History. Professional appraisers are now being contacted so that arrangements can be finalized for this program to be held during the Harvest Festival. If this is something you might be interested in attending, please give us some feedback. Suggestions for appraisers are also welcome. Volunteer Recognition. The month of April was National Volunteer Recognition month and the Center for History was delighted to honor volunteers of 2010 and 2011. Sixty volunteers were invited to a beautiful reception in their honor to thank them for the over 7,637 volunteer hours they gave us in 2010 and 2011. This year we recognized service to both the N. Manchester Center for History and the Historical Society in general. Individuals with more than 100 hours accumulated were given monogrammed polo shirts with the Center for History logo in appreciation for their dedication and service. The NMHS also recognized Volunteers of the Year 2010—JoAnn Schall and John & Bea Knarr, and—for 2011 Volunteer of the Year, Ralph Naragon. We wish to thank the reception committee, Darlene Bucher, Eloise Eberly, Jeanette Lahman and Dorothy Weldy, for their help in making the evening especially lovely and tasty. We at the Center are especially proud of the fine work all of our volunteers do. If you think you’d like to become a volunteer, please contact us immediately. We welcome and need more people to become involved. You don’t need to know anything about N. Manchester’s history in order to be helpful to us. Call today! 260-982-0672. Peabody Mansion DVD Available. A film titled “Journey’s End: The Building of the Peabody Mansion” has just been released by the N. Manchester Historical Society and is sold only in our gift shop. This film was shot in the 1930’s by Tom Peabody himself, as the home we fondly call the Peabody Mansion was being built. This 60 minutes movie shows the craftsmen of that time period doing what they were so skilled at. While Mr. Peabody was initially concerned about going ahead with the building of his home during the Depression era, townspeople urged him to proceed because it would provide jobs for local tradesmen. You won’t want to miss seeing the framers, brick layers, road paving machines, landscapers, and many more as they helped to build this outstanding home. The cost of this DVD is $15 and may be ordered by calling 260-982-0672, by emailing us at nmhistory@cinergymetro.net , or by stopping by the Center for History at 124 E. Main Street during office hours. NOTE: Another DVD, “See Yourself in the Movies”, made in 1938 of the entire town and its citizens, is also for sale at the same price. Recent Acquisitions at the Center for History. Among the more important and interesting acquisitions we received this year, were from Dave Tranter and his three separate collections. One was the Knights of Pythias memorabilia, which included the K of P rose colored silk robe, several ritual booklets, lodge badges, ribbons, and photos. We also received Ace Hardware items from Dave, which included a portrait of Ivan Little, owner of Little’s Ace Hardware. We also received a horn seeder made by Cyclone Seeder from Urbana, a 48 star flag, a wooden Hardware sign and several small items. The largest part of the donation was The Print Shop. It included antique printing machines, presses, two Forgery Proof check writers, a lead slug cutter, a chase, quoins and quoin keys, used to hold print in a chase. We were also given a book stapler, desk press, almost 200 print blocks along with many pieces of metal type. There were wooden and metal spacers used in setting up type. Also antique typewriters, desktop calculators, a Comptometer (hand operated adding machine), several Lino Type books, several wooden Print Shop signs and photos. Another interesting acquisition we received are three advertising posters from the “pink house” at 508 Miami Street, where Ferne Baldwin lived, and which she still owns. The posters are advertising “Seiberling Rubber Heels”, with a fashionable young lady on two of them. The other is advertising “Cat’s Paw Rubber Heels”. This is where Noah Baker had his shoe repair shop in the late 1920s. While remodeling the house recently, these posters were found in the wall, and retrieved.